BOSTON — A trial alleging racial bias in Harvard University’s admissions system has presented two starkly different images of the elite Ivy League school. One side depicts a Harvard that plays racial favorites, lowering the admission bar for certain races and raising it for others, to the detriment of Asian-Americans. The other side paints a Harvard that gives a slight edge to some minorities in the pursuit of diversity, but only those who would likely be admitted anyway. Now it’s up to a federal judge to decide which is closer to the truth. Both sides clashed Friday in the closing arguments of a trial that has been four years in the making and sits at the center of a reignited debate over affirmative action. Its outcome carries weighty implications for other colleges that also consider race when selecting students. The group behind the suit, Students for Fair Admissions, says Harvard’s gatekeepers hold Asian-American applicants to a higher standard and discriminate against them using a subjective “personal rating” that measures traits such as courage and likability. Using six years of school admissions data, the group found that Harvard officials consistently gave Asian-Americans the lowest scores in the personal rating, while scoring black and Hispanic students the highest. Asians fared well in other categories including academics, yet they were admitted at the lowest rate. “We think this is strong evidence that race is being used in the personal score for all of these ethnicities, and it is evidence of an Asian penalty,” John Hughes, a lawyer for the group, said in his closing argument. Harvard insists that the group’s statistical analysis, done by a Duke University economist, is flawed, and presented a dueling analysis from a University of California, Berkeley, economist who found no evidence of bias. The school’s lawyers emphasized that race is only one of many factors considered in its “holistic” review of applicants, and that race can only help, never hurt, a student’s chances of getting in. “Harvard has worked over the years tirelessly to create a vibrant educational environment that includes students from all walks of life. We do not admit simply GPAs and board scores, we admit people,” said William Lee, a lawyer for Harvard. The trial lasted three weeks and featured testimony from more than a dozen current and former Harvard employees, along with scholars and policy experts. Yet no student ever took the stand claiming discrimination. Students for Fair Admissions, a nonprofit based in Arlington, Virginia, says its 20,000 members include some Asian-Americans who were unfairly rejected from Harvard, but it did not call on any to testify. Harvard’s lawyers jumped on that omission while noting the “powerful” testimony from several students who testified in support of the school. “If there was an application filed after all of this that showed discrimination, wouldn’t we have seen it?” Lee said. The trial has revealed new and sometimes uncomfortable details about the process Harvard uses to pick about 2,000 students a year out of more than 40,000 applicants. During testimony, William Fitzsimmons, the longtime admission dean, explained how each student is given a rating in four areas: academics, extracurriculars, athletics and the personal rating, along with an overall score. Students can choose to provide their race, which may offer a “tip” toward admission, as can other factors like family income or geography. Final decisions are made by a panel of 40 Harvard officials. Yet there are other ways into Harvard, too. Students for Fair Admissions revealed email exchanges in which Harvard officials openly discussed the family ties or wealth of certain applicants as they decided whether to admit them. It also cast light on a “dean’s list” used to track students of special interest, including the children of donors. 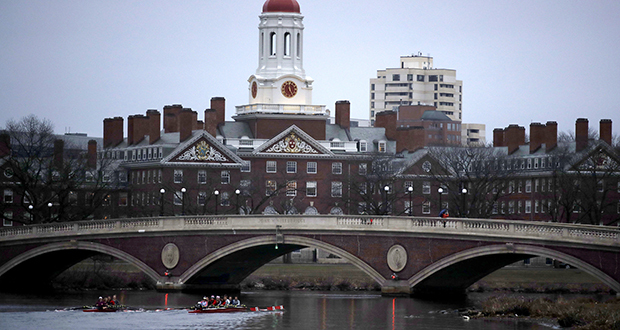 The group says such preferences work against racial minorities, while Harvard says it admits the children of donors only if they are otherwise qualified. The case is being weighed by U.S. District Judge Allison D. Burroughs, who may take weeks or months to issue a ruling. Either way, it is likely to be appealed. The founder of Students for Fair Admissions, Edward Blum, previously orchestrated a similar lawsuit alleging that the University of Texas discriminated against white applicants. That case was appealed and eventually heard by the Supreme Court, which narrowly ruled in favor of Texas in 2016. What a joke. No surprise to me that Harvard did this. I mean the world is under the influence of a substance responsible for racism.